MIAMI –– When Thomas Honker – a professional collector with almost 20 years of diving experience off the Florida coast – asked me a year ago if I might be interested in joining him on a diving-shelling trip to some of his favorite spots, I answered "Yes." Who wouldn't? Finally, one partly cloudy Saturday morning we met at Delray Beach. Tom felt that the poor water visibility and the rough sea wouldn't make a dive worthwhile. "Perhaps today we'll find a live Cypraea surinamensis out there," I suggested brightly as Tom watched the rather large waves from the shore. "That, I guarantee, we will not," he replied definitely. In 18 years of looking under thousands of rocks, Tom had found only one C. surinamensis dead, juvenile, somewhat eroded. That was back in 1967. In fact, he knew of only one live specimen ever having been found by a SCUBA diver off Florida. That was in 1974. Dave Akers was looking for Spondylus in well over 100 feet of water off Boynton Beach at the time. The shell eventually went into the extensive collection of Elsie Malone, of Sanibel Island. Nevertheless, Tom finally decided to try a dive and we launched his 15-foot Boston Whaler. Our dive was in 50 to 70 feet of water about a mile from shore. The loose rubble ranged in size from pebbles to boulders two feet in diameter. In some places they were piled six feet high. With profuse marine growth, the entire area is an ideal molluscan habitat. On our first dive, Tom missed the site by about 50 yards. He simply picked up the anchor and towed the boat against a strong wind and three-foot waves to the collecting site! Intimately familiar with the surroundings, Tom had no problem with the 20-foot visibility. As we turned rocks, a horde of large angelfish, wrasses, parrot fish and others quickly gathered. They became quite bold and could easily be touched as they approached to see what tasty morsels we turned up. In the next few minutes we found Cypraea spurca, C. cinerea, C. zebra, Cymatium pileare, C. rubeculum occidentale, Bursa corrugata, Latirus macgintyi and Pecten imbricata. (Tom told me later he occasionally also found Pecten mildredae, P. multisquamata, Cymatium labiosum and Calliostoma javanicum, the chocolate-lined top shell, at this site.) Tom had used up lots of air while towing the boat, so his dive was short. I got in about 10 extra minutes before surfacing. For our second dive, we decided that Tom would descend first. My optimism got the best of me. "The time has come for the surinamensis, Tom," I said. "Okay," was his reply through the regulator. When I reached the bottom a few minutes later, Tom frantically waved me over to him. As I approached, he pointed to one of the small plastic vials he carries for fragile or rare specimens. I was certain at first that he had found a Conus granulatus, very rare, highly prized and beautiful, one of Tom's favorites. Looking more closely, however, I realized that the shell was not slender like a cone, but oval. And – good grief! – it had long branched papillae and an overall yellow-orange appearance. I knew immediately that Tom at last had found a live C. surinamensis. 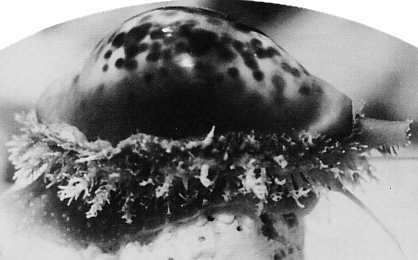 I tapped the vial gently and the mantle was retracted, exposing a beautiful salmon-color cowry with darker burnt-orange markings across the dorsum. Tom was shaking his head in disbelief.I was, too. Needless to say, I lifted many rocks on that dive. Back in the boat, we examined the shell closely. It was fully mature, in absolutely gem condition, beautifully colored and over 30mm long. Tom had found it under a small rock right on top one of the piles, amidst white encrusting sponge. Home, we placed the cowry in a shallow container of sea water. After a while it spread its mantle and allowed us to photograph it. Tom put it in his aquarium, hoping to get photos by flash next day but, alas, it died during the night. For several months Tom didn't offer the shell in his list and I began to wonder whether he had decided to keep it for himself. He had promised me first refusal, however, so I more or less concentrated on finding a specimen for myself (which has yet to occur, of course.) All this added to my surprise when, on opening a Christmas package from my wife Carolina, I discovered that same Cypraea surinamenis inside. Definitely, a well-chosen Christmas present.